To keep up with our burgeoning order book, we have invested in some mega roll handling equipment. Plain label manufacture is a core activity and sales come in from Positive ID Labelling, our sister company Danro Labelling Systems and our dedicated plain label and label printing operation, LynkData. 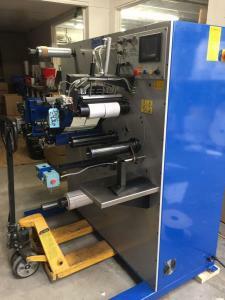 Recently, order volumes have increased and we have chosen to increase capacity with the addition of a new Daco PLD350 plain label converter. This partners our current turreted PLD350 and PLD250 plain label converters. To ensure we can get the feedstock onto these and keep them running, we have also invested in a new roll loader. This allows us to load up to 6000m of material in one go and ensures production keeps running smoothly. The roll handling equipment works on the front of the forklift. This allows us to manipulate the orientation and alignment of rolls weighing up to 500kg. This is a massive change from staff having to lever rolls into place using manual lifting equipment or more primitive methods such as crowbars! All new equipment was installed and fully operational in the middle of May.